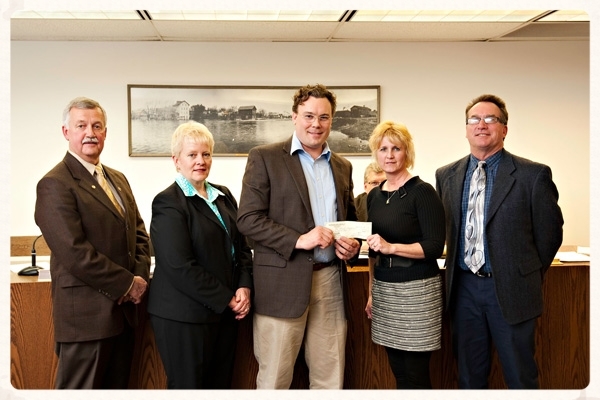 City of Jefferson to benefit with trees funded by Northwoods Casket Co.
Jefferson, WI. Wisconsin casket builder, Northwoods Casket Co, presented a grant Tuesday evening to the Jefferson City Council for spring tree plantings throughout the city on April 24th, the week of Arbor Day. Jonas Zahn, President of the Beaver Dam-based company, shared his enthusiasm for community-supported tree planting with the city council. City of Jefferson Parks and Forestry Director, Cyndi Keller, is organizing the tree planting and other community participation next month. Jefferson funeral home owners Marla and Ron Michaelis of Schneider-Michaelis Funeral Home have partnered with Northwoods Casket Co to make the grant possible. Marla and Ron attended the council meeting and are excited to participate in the community plantings. Cyndi Keller has arranged an educational program that will be presented by WI Department of Natural Resources Urban Forester, Olivia Witthun, for 130 students from the high school freshman class. Following the program the students will plant the donated trees in Riverfront, Stoppenbach and Tensfeldt Parks. Northwoods Casket Co, based in Beaver Dam, sponsors tree plantings statewide with urban plantings this spring in Jefferson, Beaver Dam, Minocqua, and Wonewoc. Last year trees were planted in Sheboygan, Wonewoc, Beaver Dam, and in the Kettle Moraine State Forest. The company's statewide tree planting initiative began in 2012 and has earned Northwoods Casket Co an award from the State of Wisconsin as "Innovator of the Year" for their creativity and commitment in tree-planting. The company plants 100 trees for every casket they make. About Northwoods Casket Co. - Founded in 2006 by Jonas and Julie Zahn, the Northwoods Casket Co builds environmentally friendly wooden caskets with sustainable practices and Wisconsin-grown lumber. The company distributes caskets to funeral homes and funeral supply companies nationwide. Their mission is to plant 100 trees for every casket they make. The company can deliver a casket to any funeral home in the United States and can be found online at www.NorthwoodsCasket.com. About Schneider-Michaelis Funeral Home - Owners Marla and Ronald Michaelis have been active members of the Jefferson community supporting and participating in local Kiwanis Club, WELCA, Cab Ride Program, the city utilities commission, as well as Trinity Lutheran Church. Licensed in 1996, Marla Michaelis has seventeen years experience in funeral services and is one of a growing number of Wisconsin funeral homes offering green and natural burial services as an alternative to the conventional funeral. Jonas Zahn presenting a check to the City of Jefferson for an urban tree planting initiative.